The world of 2050 is a world of contrasts and paradoxes. On the one hand, science and technology have continued to advance in response to emerging crises, challenges and opportunities. 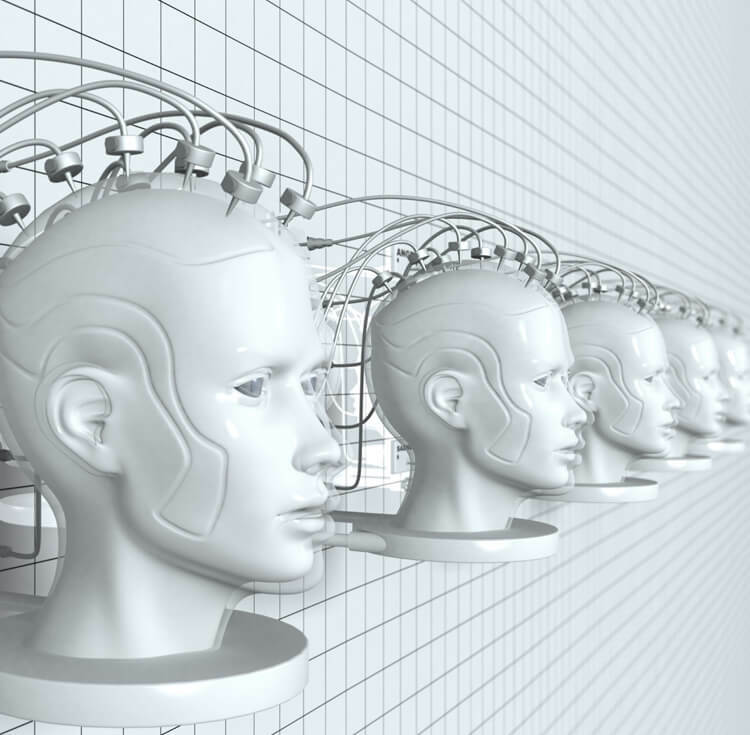 This has created radical transformations in genetics, nanotechnology, biotechnology and related fields. 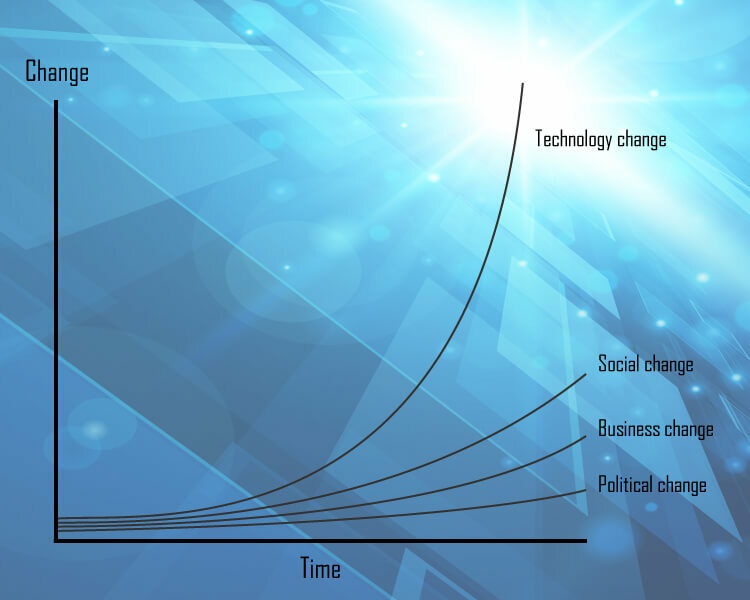 On the other hand, many of these same technologies have been so disruptive that it has led to a more frightening, unpredictable and chaotic world than ever before. Humanity is now at a crossroads that will determine its future path for centuries to come – survival or destruction, prosperity or collapse. As more and more wealth trickles upwards to the hyper-rich elite, there is a growing consensus that money itself – the profit motive – is a major obstacle to future progress, and a new driving force may be required for civilisation to flourish. Debates are raging on what reforms to make in order to adapt societies to this rapidly changing world. People everywhere sense that a great transition is approaching, the likes of which has never been seen before in all of human history. * It is clear that some new global paradigm will appear; but it is still unclear what this will be. Decades of stagflation have produced a fragmented, chaotic and perpetually sluggish global economy. Nearly half of the world's nations have "junk" credit ratings, effectively making them bankrupt. * US national debt has now reached almost 400% of GDP,* far exceeding even the levels seen during World War II. China and India, though surpassing the US in overall GDP,* have also stagnated. In the face of economic catastrophe, international politics has faced enormous challenges. Although the number of democratic countries has risen significantly over the years,* many have turned inward, cutting off foreign relations. Revolutions, wars and failed states have produced a strikingly different geopolitical map than seen at the beginning of the century. To repair and maintain the fabric of society, an increasing number of regions have abandoned their national currencies in favour of interest-free, non-fiat, non-inflationary local ones. * Decentralised cash systems such as the Bitcoin* and other electronic alternatives have also exploded in use. Social systems are under extraordinary stress today. The younger generations are increasingly resentful towards the elderly – seeing them as the cause of many problems, and a drain on capital as the ratio of workers to seniors continues to fall. ** The rich and poor have continued to grow apart, now that upward social mobility has become next to impossible. Massive protests outside corporate HQs and gated communities are a daily reality on the news. Global warming has created almost 150 million climate refugees: a sixfold increase compared to 2010. * The influx of people to foreign lands has put a further strain on economies. Resentment towards migrants has produced an upsurge in nationalism with many isolationist parties sweeping government elections. To maintain order and stability, martial law and military occupation is a feature of many cities around the globe. Radical new political parties and movements have emerged, advocating the overthrow of the reigning system. Recycling and waste management – for decades neglected by many countries* – are among the issues now taking centre stage. * New regulations and market pressures have forced corporations to move away from the model of planned obsolescence** and mass production, to one of conservation and responsibility. Most firms no longer sell entirely new models of their products when technological advances are made. Instead, replacement components and upgrades form the bulk of profits, with items made of universally interchangeable parts. In a world of increasing resource conflicts, "doing more with less" has become an essential mantra. * A system is also employed whereby customers return products at the end of their life cycle, to be used as materials for the next generation. In some of the worst-hit countries, mandatory resource dumps are organised, in which citizens are obligated to recycle any unnecessary possessions. Naturally such systems are highly controversial and intrusive. Meanwhile, the widespread use of robots,* automation,* 3D printing* and other technology has rendered obsolete many traditional human roles. Though industries have made vast improvements in speed and efficiency, it has come at the expense of a declining labour force. Consequently, overall government revenues have seen a net reduction. Radical Islam and its resentment of the West continue to produce new Jihadists. In addition, underground groups ranging from those angry at the first world's neglect, to anarcho-primitivists, have sprung up. By 2050, at least one terrorist nuclear attack on a major world city has been conducted by one of these groups. Large amounts of nuclear material had been missing from Russia since the 1990s and some inevitably fell into the wrong hands. * Being orders of magnitude greater than 9/11, the effects of this attack leave a deep psychological scar on many people alive today, fuelling much paranoia and suspicion between nations. Despite this turmoil, progress has been achieved in cooperating on certain key issues, such as global warming. Carbon emissions have fallen substantially compared with 1990 levels,* thanks to a global carbon tax* and the widespread deployment of solar, wind and wave power,* together with 4th generation nuclear. * Fossil fuel reserves were declining in any case. ** Fusion power is also becoming available now* and is being adopted by some of the leading nations. Orbital solar is another emerging industry. * Energy efficiency and conservation have provided further reductions in CO2 output. However, carbon emissions from earlier decades remain locked into the system. 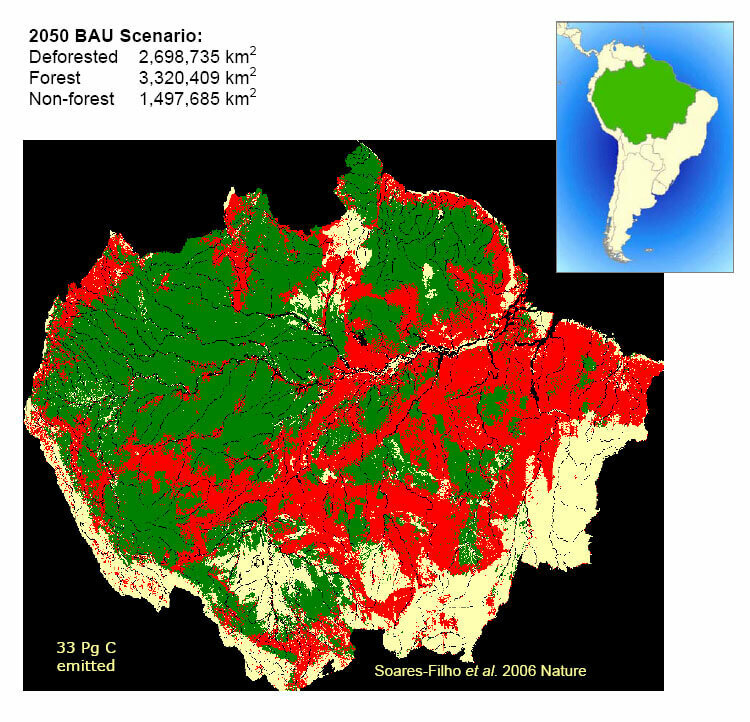 This delayed reaction will continue to affect weather patterns and climate stability,* as will the ongoing destruction of the Earth's rainforests, some of which are transitioning from carbon sinks to carbon sources. Sea levels have risen over a foot by now* and are beginning to affect much of the world's coastal real estate. Large-scale carbon capture and sequestration** appears to be humanity's last and only hope of reversing these trends. As a result, over 30 billion tons of carbon have been added to the atmosphere. 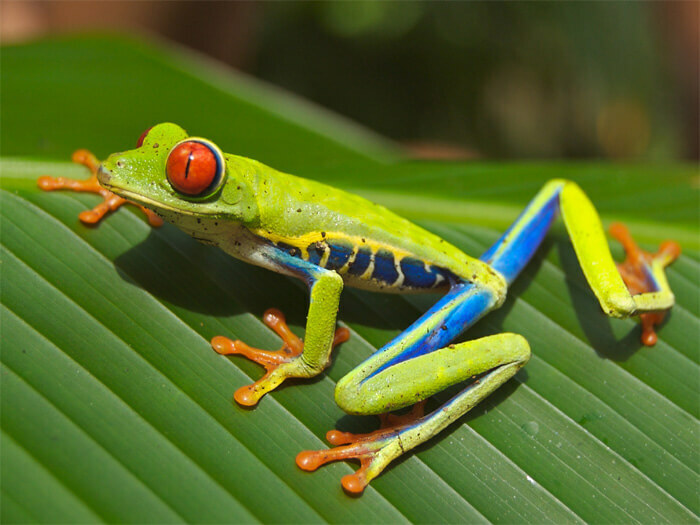 Although clean energy sources are offsetting this, they can't save the countless species of plant and animal life dependent on the rainforest for survival. Substantial amounts of biodiversity have been lost. Desperate efforts are being made by non-profit organisations to obtain DNA samples, in the hope of resurrecting these species at some point in the future. 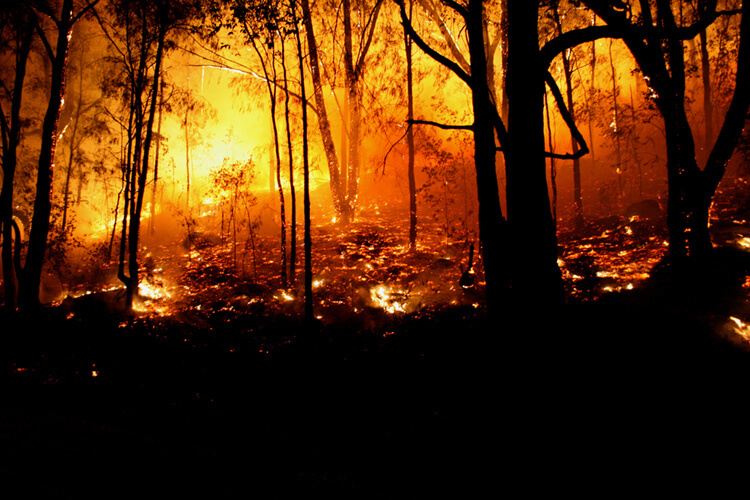 These wildfires are triggering positive feedback loops. As more and more carbon is liberated from burning material and released into the atmosphere, this is further accelerating the pace of global warming. By far the greatest impact from global warming has been in the seas and oceans,* where changes in heat content, oxygen levels and other biogeochemical properties have devastated marine ecosystems. 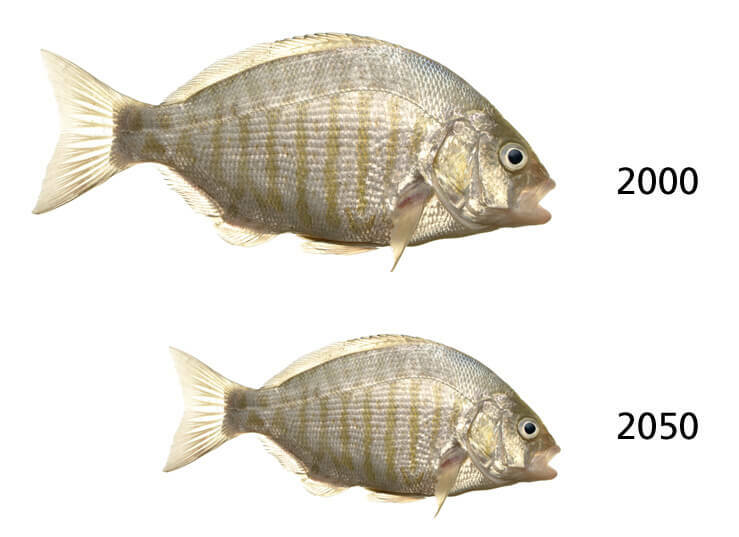 Globally, the average body size of fish has declined by up to 24 per cent compared with 2000. * About half of this shrinkage has come from changes in distribution and abundance, the remainder from changes in physiology. The tropics have been the worst affected regions. Buildings are integrated into the city around them in a number of ways. Fuel restrictions and other factors have led to increasingly socialised transportation. The bottom floors of most towers have dedicated public car share (AI controlled) and bike share facilities, while bus and other mass transit stations are often built into the structures themselves. Pedestrian sky-walkways feature heavily in most modern cities, improving access and permeability of the urban realm, while shielding walkers from the elements. If ornamented with foliage, they can also function as elevated parks and gardens. The average modern building in 2050 is seamlessly integrated into a city's power supply, acting as another node in a city-wide smart grid. 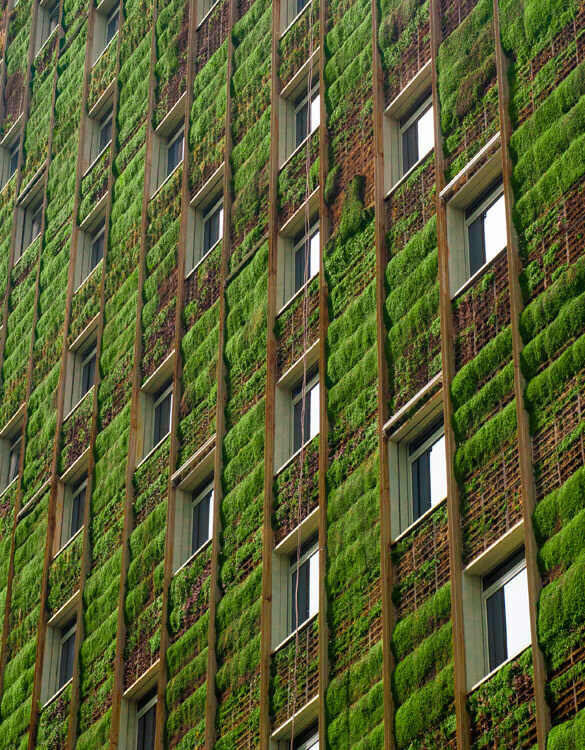 Nearly all buildings are able to transmit locally produced energy back into the system. Wireless electricity transfer is also common, with energy beamed invisibly between buildings, which eliminates the need for unsightly poles and cables. AI systems within each building direct its total power consumption, adjusting according to the varying needs of occupants and taking into account even the most minor of details. Overall, this new smart infrastructure is helping to drastically improve the nature of urban living. 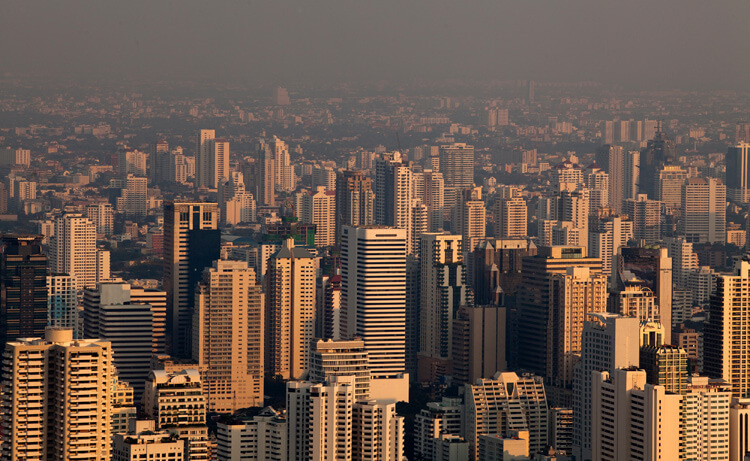 Cities following this model are becoming far more liveable, clean, efficient and modernised. Though many regions have collapsed into chaos, others are now leading the way in providing a more sustainable path for humanity. Increased living costs, lifestyle changes and environmental factors have resulted in smaller, more energy-efficient cars that are usually rented on demand rather than owned. More people than ever before are choosing to live and work alone, while the number of children per couple has also declined, which is reducing the demand for larger and more expensive vehicles. Practically all cars in the developed world are now self-driving* and either hybrid or pure electric, while traffic flow and other road management issues are handled by advanced networks of AI. The resulting fall in congestion has boosted economies by billions of dollars. Air pollution has also declined greatly. The inherent safety of being controlled by machine intelligence, rather than human hands, allows for greater speed of travel. An increasing number of countries are removing the speed limits on highways. Even when crashes do occur, which is extremely rare, built-in safety features and tougher materials (e.g. carbon nanotubes) mean that fatalities are becoming virtually non-existent. 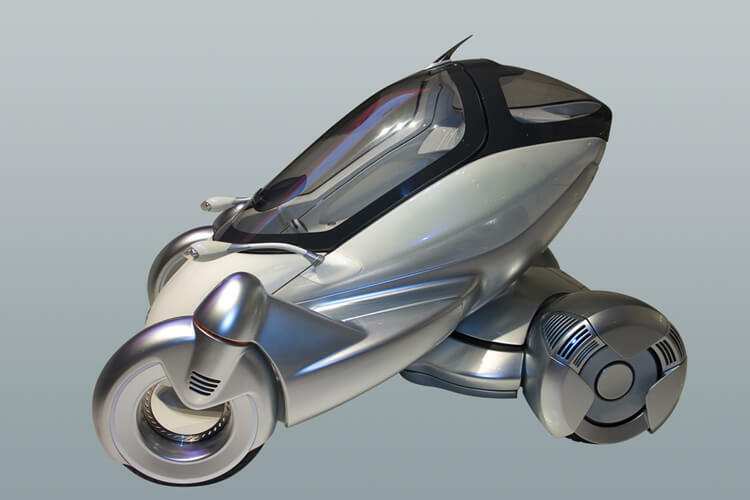 A typical mid-range car of 2050. Commercial airliners of 2050 are safer, quieter and cleaner than those of earlier decades. The vast majority are based on some form of renewable energy. In addition, travel times have greatly improved. Hypersonic engines, which entered use in 2033, have seen further development, aided by the rapid growth of artificial intelligence and the resulting advances in computer-automated design evolution. It is now possible to reach anywhere on the planet in under 2.5 hours. The interiors of most planes are breathtakingly luxurious compared to those of earlier decades. New materials have enabled the use of transparent walls and ceilings, flooding the fuselage with natural light. Seating areas are beautifully spacious and filled with a range of interactive technology. When flights are running at less than full capacity, any unneeded seats are automatically shuffled to the rear, where they collapse and are hidden from view. The remaining seats are redistributed, rearranging themselves to offer everyone the maximum possible legroom. These seats can also morph to perfectly fit passengers' bodies. They can re-energise travellers with vitamin and antioxidant-enriched air, mood lighting, aromatherapy and acupressure treatments. * In the mid-section of the plane is a hi-tech zone offering a range of activities from virtual golf, to conference facilities and bar/lounge settings. The need for reliable, clean, cost-effective energy has led to the creation of electrical "supergrids" across much of the world. These allow nations to share power from abundant green sources and distribute it to those regions most in need. By cooperating in this way, it is possible to greatly reduce waste and to optimise power supplies on a continent-wide scale, at all times of the year. For instance, winter gales in the North Sea can provide a surplus of wind power, which is complemented by the summer winds of Morocco and Egypt. 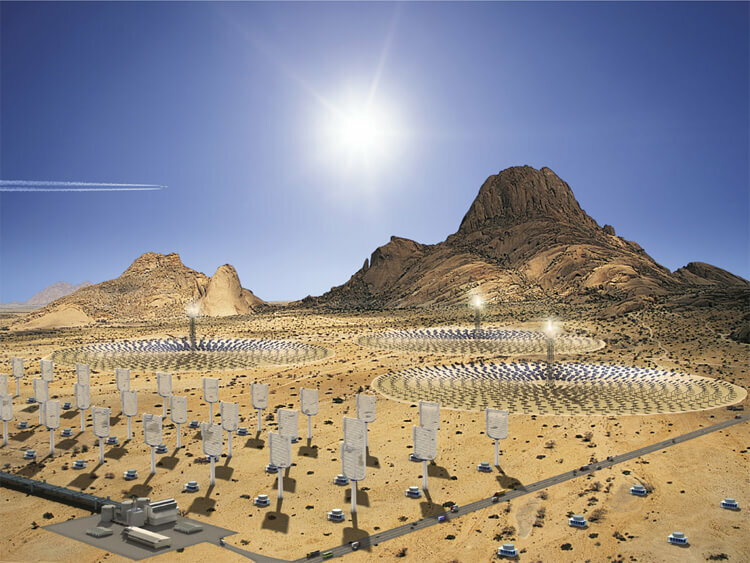 Meanwhile, solar panels in northern Africa generate three times the electricity compared with the same panels in northern Europe, due to much greater intensity of sunlight. 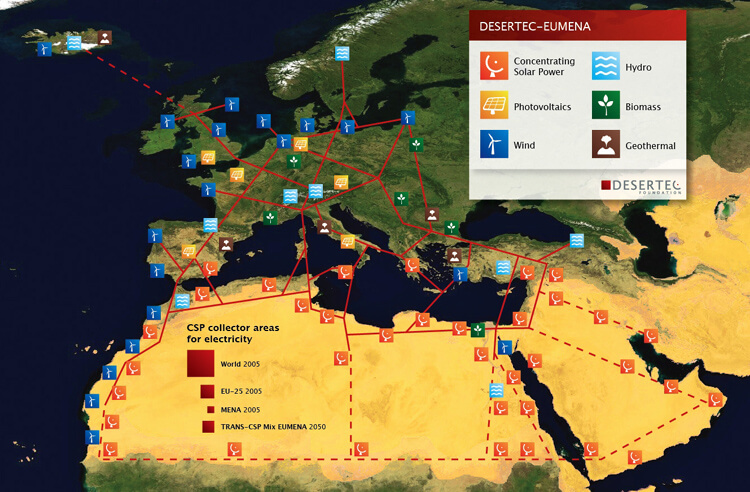 Up to 100 GW of power is being supplied from Africa to Europe in this way. * Similar large-scale infrastructure is now in place throughout America, Asia and other parts of the world. Long distance transmission technology has seen major advances over the decades. Each country is connected to the grid using high-voltage direct current (HVDC) transmission, instead of traditional alternating current (AC) lines. This results in far greater efficiency, since DC lines have much lower electrical losses over long distances. 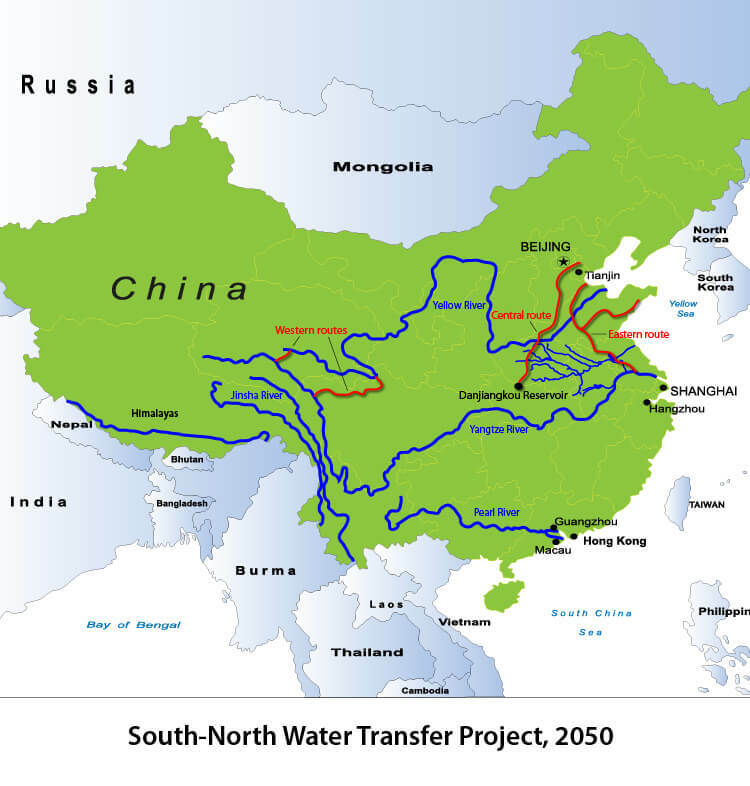 The South-North Water Transfer Project – proposed almost a century ago* – is finally completed in China this year* at a cost of over $60 billion. * This becomes the largest project of its kind ever undertaken, stretching thousands of kilometres across the country. Its main purpose is to divert water from the southern region of China to the dryer north. It is hoped that this will spur economic growth and stability in the more populous northern area, where the per capita share of regional water has declined to near-crisis levels. It consists of an extensive system of tunnels, dams, reservoirs and canals, all connecting and diverting water from China's largest rivers – including the Yangtze, Yellow and Hai River. At its peak capacity, the entire system can move nearly 45 billion cubic metres of water annually. First proposed by Mao Zedong in 1952, the project was officially approved in 2002. The first stage of construction, the 717 mile (1,155 km) long eastern route, was completed in 2013. This begins near the mouth of the Yangtze, crosses through the Yellow River and ends at the Beijing-Tianjin Metropolitan area within the Bohai Economic Rim. This brings much-needed water to one of the largest and most high density conurbations in the world. Along with the construction of new tunnels and pumping stations, the Grand Canal was upgraded in order to accommodate the increased flow of water. * Adding to this is the central route, completed in 2014. This brings water from the Danjiangkou and Three Gorges reservoirs, as well as the Han River, north to Beijing and its neighbouring provinces. This totals 787 miles (1,267 km) in length and by 2030 was diverting over 13 billion cubic metres of water annually. The third and final stage to be completed is the 310 mile (500 km) western route. This involved working on the Qinghai-Tibet Plateau – from 3,000–5,000m above sea level – and posed major engineering and climatic challenges. This route diverts water from the headwaters of the Yangtze to the parched eastern plateaus. Many doubted that China had enough water to begin with to make the project worthwhile. Indeed, by the 2050s, southern China itself is beginning to feel the effects of melting Himalayan glaciers and drying conditions. 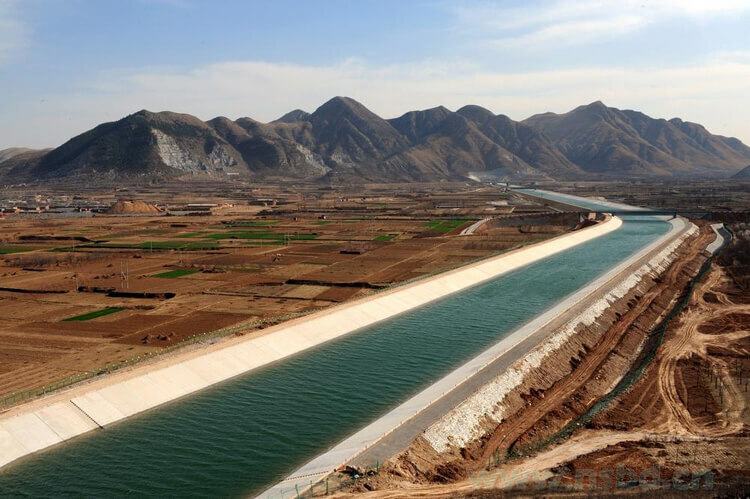 As a result, the water diversion project rarely operates at full capacity, primarily acting as a way to evenly distribute water around China, easing tensions between the inland and coastal regions. While of some benefit to China now, in the coming years, even projects of this magnitude will be insufficient to prevent serious water shortages. * Longer term, only desalination will be able to save the country. 25 See Personal service robot population, 2000-2050.